Upstream Gallery proudly presents ‘The Absence of the Artist’, a solo exhibition by Marinus Boezem (Leerdam, 1934). The exhibition will form a prelude to a broader manifestation around Boezem’s work, which will likely be organized mid-2015. Marinus Boezem, one of the founders of the conceptual art movement in The Netherlands, turned 80 this year. To celebrate this, the artist and Upstream Gallery will look back on an impressive and game changing body of work spanning over six decades. In the 1960’s Boezem discovered the use of elusive elements such as air and wind for his art and made a name with radical, immaterial works. In 1969 for example, he signed the sky by having a skywriting plane write his name with condensation trails. Boezem was one of the initiators of the ground-breaking exhibition ‘Op Losse Schroeven: Situaties en Cryptostructuren’ (1969) at the Stedelijk Museum Amsterdam and took part in the equally influential exhibition ‘When Attitudes Become Form’ at the Kunsthalle Bern in the same year. These historical exhibitions are still highly relevant: in 2011 the Stedelijk Museum organized a retrospective of ‘Op Losse Schroeven’ resulting in the acquisition of the group of works from that exhibition; key works both from the exhibition and within Boezems oeuvre. In 2013 a highly acclaimed remake of ‘When Attitudes Become Form’ took place at the Prada Foundation during the Venice Biennale. The exhibition at Upstream Gallery will focus on a theme which runs like a thread through Boezem’s oeuvre: the significance of the artist’s physical presence and absence for the concept of his artworks. A number of sub-themes and motifs regularly recur over the years, thus tightly interweaving the body of work. These connective themes include Gothic cathedrals, photographic self-portraits and the examination of the meaning of the artist’s signature. For ‘The Absence of the Artist’, a selection of works from five different decades is made. The oldest work in the exhibition is the Piss Project, a registration of an action which took place in the 1960’s: the artist drinks a glass of water directly from the North Sea and drives to the IJsselmeer lake to discharge it there. Also included is Breathing on the Picture Tube, one of the first artworks created for television ever and one of the most iconic works from Boezem’s oeuvre. Elements from this early video recur in his most recent piece God Bless You. 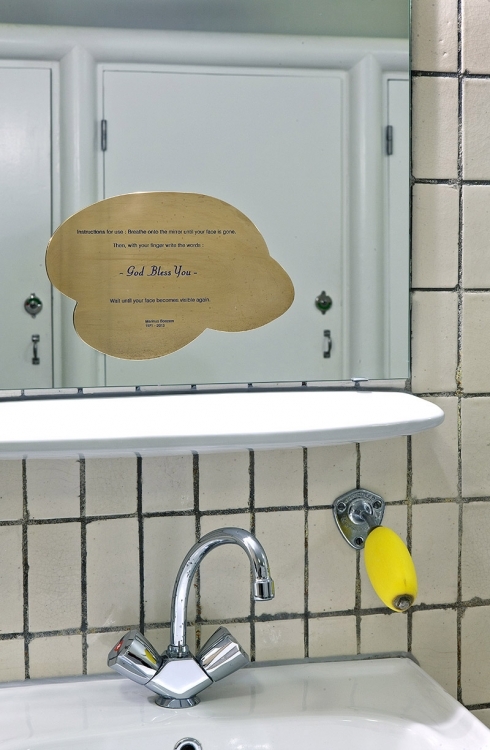 This work consists of the instruction to exhale onto a mirror, write the text ‘god bless you’ in the condensation and wait until the reflection of your face reappears. Further selected works include a number of self-portraits from different eras and a large-scale installation with mirrors. The opening of ‘The Absence of the Artist’ coincides with Amsterdam Art Weekend, a citywide contemporary art event focused on the discovery of up-and-coming artists. Although Upstream Gallery is known for its young program, Boezem is not exactly a young talent. Yet bringing his work during Amsterdam Art Weekend was a deliberate choice. Gallery director Nieck de Bruijn: “Boezem’s work is so radical that it stays young forever. Even art works created almost fifty years ago are still highly relevant and topical. He continues to inspire new generations of artists up to this present day”.